I wish I had taken more classes. I wish I remembered anything from high school. My knowledge here is a complete void. I only had to take one science course in college – I chose Intro to Biology because I wanted a softball class through which I could sit and copy-edit the student newspaper – and my revulsion to math coupled with my lack of enthusiasm for anything involving that portion of my brain (how my sixth grade science teacher, who taught us how to create circuits and compost in a worm bin, would weep). Years of playing with chemistry sets and crystal growing kits from my science-minded uncle and cousins gave way to fiction, fiction, fiction, and I forgot about chemical compounds and formaldehyde. I have been slowly reading my way through The Rodale Institute’s Organic Transition Course. And by slowly, I mean like the first 15 slides two weeks ago, and nothing since. My sister gave me a beautiful notebook made of dried leaves and recycled paper that I’m attempting to take intricate notes in, but it’s like trying to learn a foreign language right now. I’m interested, but a lot of this is totally over my head. Hopefully once I’m in the thick of things and not balancing working and moving with figuring out farming, I’ll have more time to make sense of all these words I can’t pronounce. Nitrogen, potassium, phosphorus. Ph levels, magnesium, arsenic??? Not only do you have to determine your soil tilth, which is its texture and ability to hold moisture and circulate oxygen, but you have to make sure your soil is sufficient in a dozen different nutrients and doesn’t have anything sneaky lying around in it from old orchards or the years of Round-Up Ready Corn that grew on the premises beforehand. This is some of the stuff we need to figure out right away with the land in the Lehigh Valley so we can get it ready now for next season. 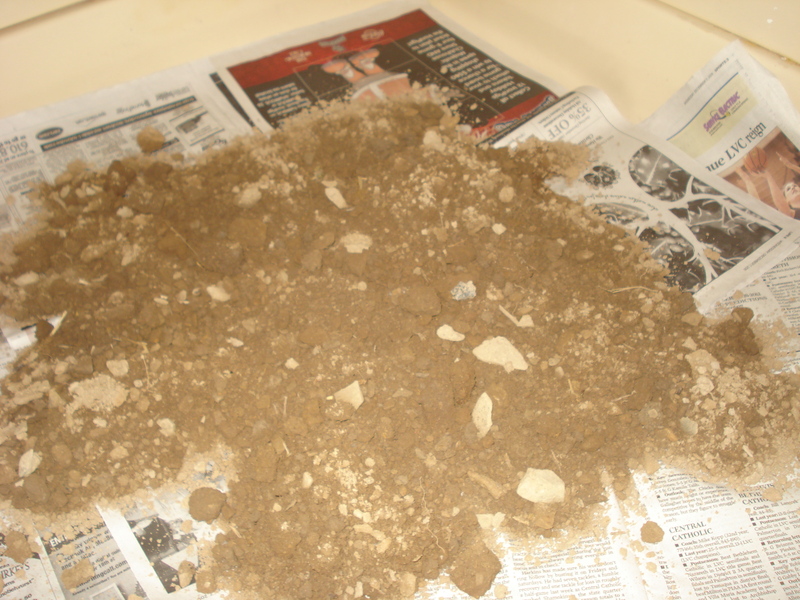 We live in a shale region, and I didn’t see a single worm during our soil testing investigation. I’m more than a little nervous. But other folks around us are growing. Over the weekend my sister and mom spoke with an organic farmer whose property runs adjacent to our, and he was totally stoked to hear of our plans. Which was encouraging – knowing that someone who can handle farm equipment is ready and willing to help makes me feel worlds better. After days of Google searches and an afternoon of wandering Tractor Supply Company, we emerged victorious two weeks ago with two separate soil test kits. 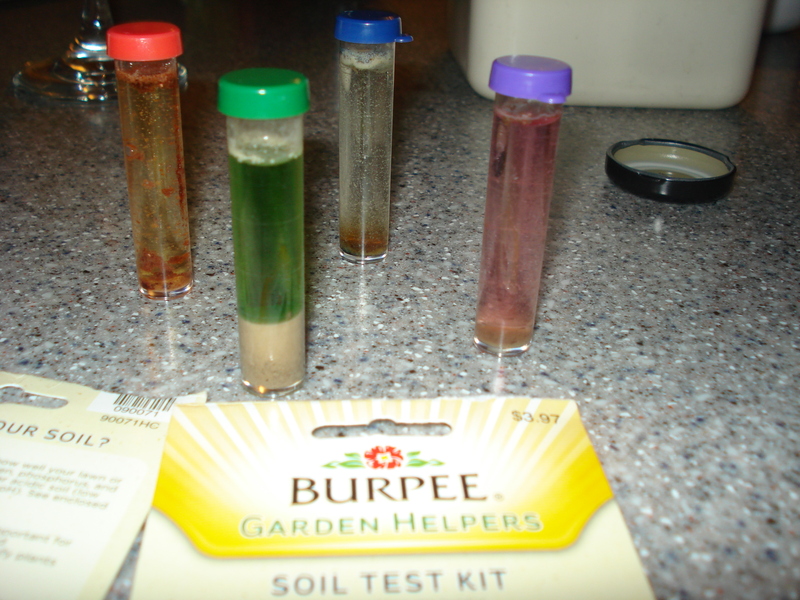 One, an easy, softball Burpee soil test kid, measuring our NPK and Ph levels with mere teaspoons of dirt. Dump it in the test tube, shake it around with the chemical capsule and wait for it to turn pretty colors. I was sold immediately. The test was the simplest thing imaginable and made me feel like I was ten again playing with an old chemistry set, but the results are less than thrilling. Our NPK is at disastrous levels (which is to be expected, really – feeder corn and soy can really drain down the land), though our Ph is sufficient for most types of plants. Doesn't just looking at this make you want to make one of those fizzy volcanoes from elementary school science class? Clearly, we need to take action. Our new neighbor friend suggested we plant red clover, which sound like a great idea (I mean, red clover sounds cool, right? What do I know about cover crops?). Our second text, a much more involved soil text we picked up at Edge of the Woods Nursery on consignment from the Penn State Extension office, proved to be a little more intense. We had to pull thirteen samples of dirt in these diagonal cuts back and forth across the two acres of land, mix the dirt segments completely, and then air dry overnight. You do all that and only send in one cup of dirt for analysis. You also have to select one specific crop you’ll be growing in the space so the lab can provide the best recommendations for that particular crop. I chose cauliflower, as, well, it’s my favorite. Roasted, with olive oil and salt and pepper. My mom makes this at Easter and Thanksgiving, and I’ve been making it for some of my folks in the office every couple weeks to much praise and enjoyment. In hindsight, picking the sample crop this way may or may not turn out to be a good thing. Then the directions lead you to an additional checklist of hard to pronounce facets of your soil that you can check if you want – mercury, lead, arsenic, and some other foreboding terms. We’re checking those because my folks are going to build a well up there at some point, and, incidentally, we’d rather not all get poisoned . Or find out we’re trying to grow poison vegetables (Is that a thing? Is that how plants work? More to come on this particular subject later). See? Look at all those science-y words on the right! Soon I’ll have a better handle on what all of this mean – and that means you will, too! If you do happen to stumble upon this post and have any suggestions or advice, I am all ears. For now, all I know for sure is that we’ve got a lot of work to do before I’ll be basking in cauliflower this time next year. 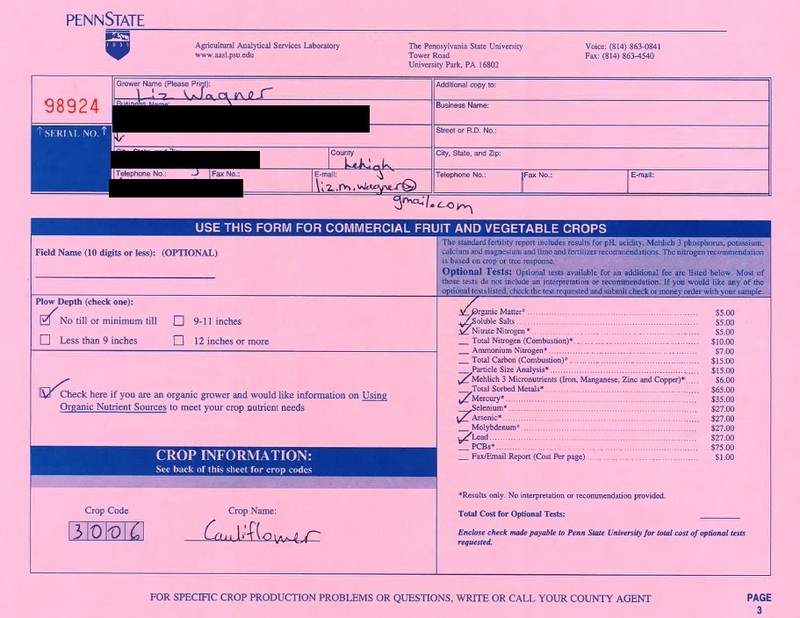 This entry was posted in Uncategorized and tagged Dirt, Organic Farming, Penn State Extension, Science, Soil Test by wagnere1. Bookmark the permalink. If your mother had to do the chores I had to do you wouldn’t be having these problems. Your grandfather had me dig a hole, put a seed in it and 3 months latter a whole vegetable garden would appear. That only worked because I had already spent hours removing all the rocks & weeds. Well next spring you can both converge at the farm and see if you can recreate the magic. My mom has done organic gardening as long as I can remember, and she’ll contact local farmers and haul away their manure for her garden – they get clean stalls, she gets free fertilizer. Usually it’s horse manure, but she tried sheepsh*t one year with good results. Of course, she doesn’t have a full-blown farm, but she’s a wealth of knowledge and can certainly give you some tips (and as luck would have it, she’s currently working at Tractor Supply in Lehighton). Ugh, did WordPress magically lose my comment? Guess so. Anyway, my mom has been doing the organic gardening thing forever, and she gets in contact with local farmers somehow and hauls away their manure – they get clean stalls and fields, she gets free fertilizer. Usually it’s horse manure, but she used sheepsh*t one year with good results. Not that she’s running a full-blown farm, but she’s certainly familiar with the basics of doing it organically. As luck would have it, she works at Tractor Supply in Lehighton. I will certainly be utilizing your mom’s expertise very soon! And visiting you for some fun cooking times.